It’s recently been reported and confirmed that Halo Master Chief Collection has now officially gone gold, but it’s also been reported that players keen to get straight into the action on day one will have a little bit of a lengthy wait as the game requires a day 1 20GB patch install for the multi-player. It’s been confirmed that if you pre-load the game you’ll be able to download the update prior to release thankfully. Halo: The Master Chief Collection takes up so much room on its 45GB Blu-ray disc that you’ll need to download a 20GB day one patch. Writing in a new blog post on Halo Waypoint, developer 343 Industries acknowledged the “large” download size but explained that it had not wanted to “cut corners” to try and cram everything onto a single disc. In happier news, the game will now launch on 11th November in the UK – the same date as North America and three days earlier than planned. Only France, Belgium and Japan will now see the game launch later that week. “From the start, our philosophy has been to give Halo fans the best possible experience and not compromise the quality or features of the collection,” executive producer Dan Ayoub wrote. “The result is that Halo: The Master Chief Collection will take up almost all of the usable space of a single Blu-ray (45 GB), and we will also issue a content update at launch that is estimated to be 20 GB. Each of the campaigns will be playable while you’re downloading the day one patch, 343 continued. “You’ll be able to start playing Campaign and more as the content is installing, with some features and multiplayer content being added via the update. Yes, the update is large, but we weren’t about to cut corners to save disc space. 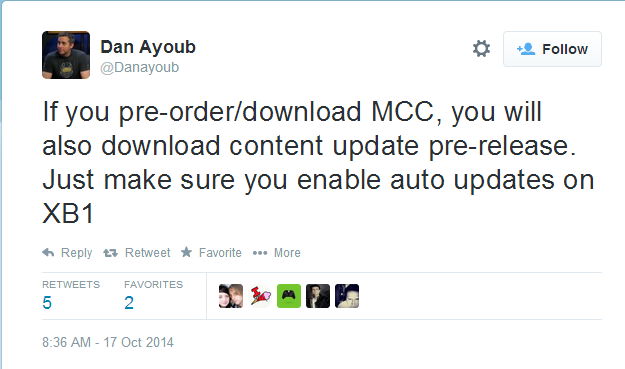 If you pre-order the game you’ll be able to auto-download the patch pre-release, Ayoub confirmed via Twitter. The Master Chief Collection contains Halo: Combat Evolved Anniversary, the newly-remastered Halo 2, plus Halo 3 and Halo 4, as well as every multiplayer map ever released for each game and a sneak peek at Halo 5. The 10-episode Halo 4 co-op experience Spartan Ops will also be available – but now in December, 343 explained. Extra “technical enhancements” are required to get the content working “smoother and even better than before”, but all episodes will be available at the same time. HD Remakes: Cash Cow, or value for money? ← How do you ‘solve’ a problem like Destiny?